This week, I’m dusting off some older, popular posts and re-posting them. I love this post. I was really proud of this one from January 12, 2011. Enjoy! I grew up in a small town on the coast of south-western Newfoundland called Corner Brook. Population: 24,000. Tim Hortons: 3. Starbucks: 0.
city” fare. The day I arrived in Vancouver after driving across the country when I made the cross-country move, what do you think the first thing I did was? Went to Starbucks. I even have a photo of me, leaning, smugly self-satisfied, against the hood of my ’88 Toyota Corolla, with my Starbucks. Times have changed. My twenty-year-old self longed to do the sophisticated things that big city people did, like hang out in coffee shops and drink cappuccinos. My forty-year-old self would rather have Tim Horton’s again, finds Starbucks overexpensive, oversweet, and not all that tasty, and if I had the chance, would give my business to a smaller, locally-owned indepdendent coffee shop. But you have to give them props for their branding strategies. Starbucks is a marketing leader in the world. Not just because there is one on every street corner in almost every corner of the world, including Asian countries where coffee is not a part of their culture. Starbucks took the concept of a European coffee cafe and brought it to America via Howard Schultz, Chairman and CEO (and, according to Forbes (2006) the 354th richest person in the United States. Previous to Starbucks, coffee was served in diners and coffee shops, and was cheap and not that great. There was no such thing as a triple-shot vanilla hazelnut no-foam fat-free latte. 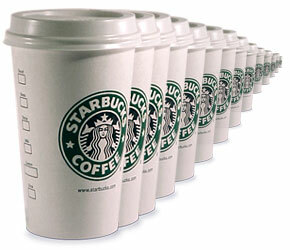 Starbucks invented those. The other thing they did brilliantly was they started to charge amounts for coffee that seemed exorbitant, but because they were creating the market, they were able to also charge the price they wanted, and people paid for it. A couple of weeks ago, I was in Seattle, just a couple of blocks from that first Starbucks. I heard the young woman in line behind me say “I need a Starbucks.” I’m pretty sure what she meant was, I need a coffee. Or maybe just I need caffeine. But what she said was I need a Starbucks. Whatever your feelings might be about Starbucks, when the proper name of a product takes over and begins to mean the thing that is its category, that is some very powerful branding.